Best camera phone in this price range. 13 MP f/2.2 rear and 16 MP f/2.0 camera for selfies. Both camera can be rec 1080p@30fps video. Lower display PPI (only ~236 pixels per inches ). No USB type C port. 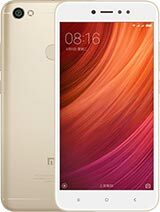 Xiaomi Redmi Y1 was launched in November 2017, this device also called Xiaomi Redmi 5A prime. This phone comes with 5.5 inches display that resolution and display PPI is not so good. This device display has 720×1080 pixels and 236 pixels per inches. Redmi Y1 is powered by Octa Core 1.4 GHz processor and it comes with 3 GB/ 4 GB ram and 32/ 64 GB internal memory that can be increased up to 256 GB via microSD card. It’s a selfie base camera phone., the Redmi Y1 packs a 13 MP, f/2.2 rear camera and a 16 MP, f/2.0 front shooter for selfies. This device runs with Android 7.0 and latest MIUI 9.0 and it’s powered by non removable Li-ion 3080 mAh battery that can be stand by up to 240 hours and up to 70 hours music playback. The Xiaomi Redmi Y1 is a dual SIM ( GSM and GSM) smartphone that accepts Nano SIM. It’s a entry mid level smartphone in Bangladesh and price around 13,900/- BDT 32 GB version and 16,900/- BDT for 64 GB version. Sensors -Fingerprint, Accelerometer,proximity, compass, light.